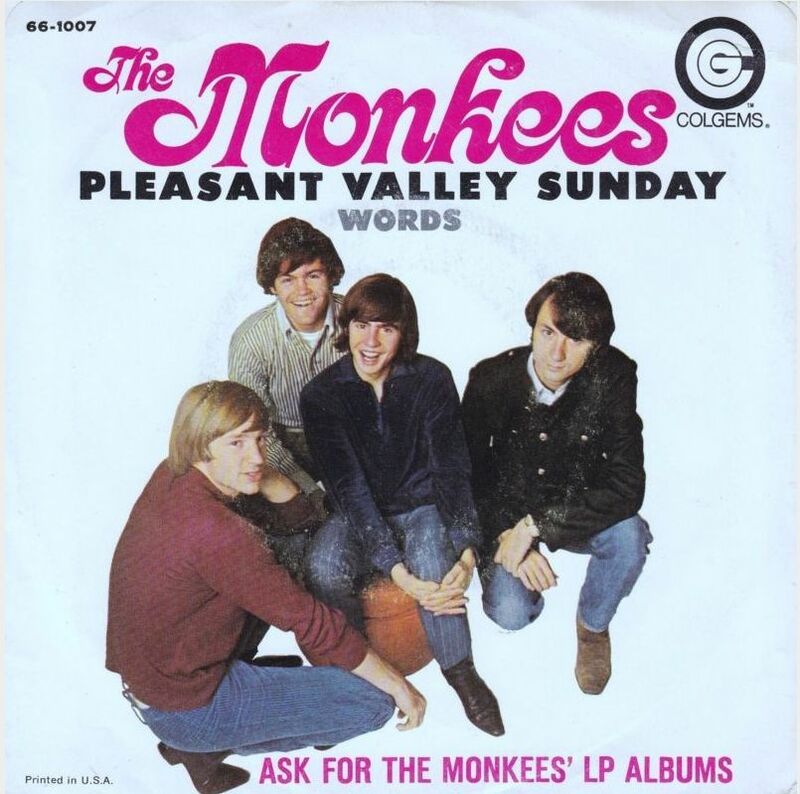 You know you’re really talented when you can write a song as great as “Pleasant Valley Sunday,” and then give it away for someone else to record. 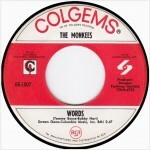 In this case, the songwriters are Carole King and Gerry Goffin, and the lucky recipients were The Monkees whose recording of the song climbed to the #3 position of the singles charts in 1967. 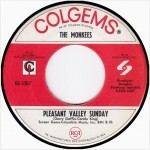 “Pleasant Valley Sunday” is a comment on social stature and suburban life that takes place on a street (Pleasant Valley Way) in upper crust West Orange, New Jersey, where King and her husband, Gerry Goffin, were living at the time. (It’s about five minutes away from where my mother currently lives.) The hilly winding neighborhood is the epitome of tree-lined suburban living with large palatial houses sporting well-manicured lawns that are visited regularly by landscaping companies. The song hails from the group’s fourth and most consistent long player, Pisces, Aquarius, Capricorn & Jones Ltd. Not only is it the group’s very best album…it is also one of the best albums to come out in 1967, the year that gave us classics like Sgt. Pepper, The Doors, Are You Experienced, Surrealistic Pillow, John Wesley Harding, Disraeli gears, Piper At The Gates of Dawn and The Velvet Underground And Nico. Like their previous Headquarters album, the group actually played their own instruments on Pisces, rather than being forced to sit on the sidelines while session musicians did their bidding in the studio. Due to the popularity of their TV show and hit singles, the group had gained enough clout by 1967 to demand that they play all of the instruments on their records which they opted to do on Headquarters. For Pisces, they were again augmented by studio session musicians including Eddie Hoh on drums, Chip Douglas and Bill Martin on piano, Chip Douglas on bass, Douglas Dillard on banjo and Paul Beaver on Moog synthesizer, but ultimately played most of the instruments themselves. 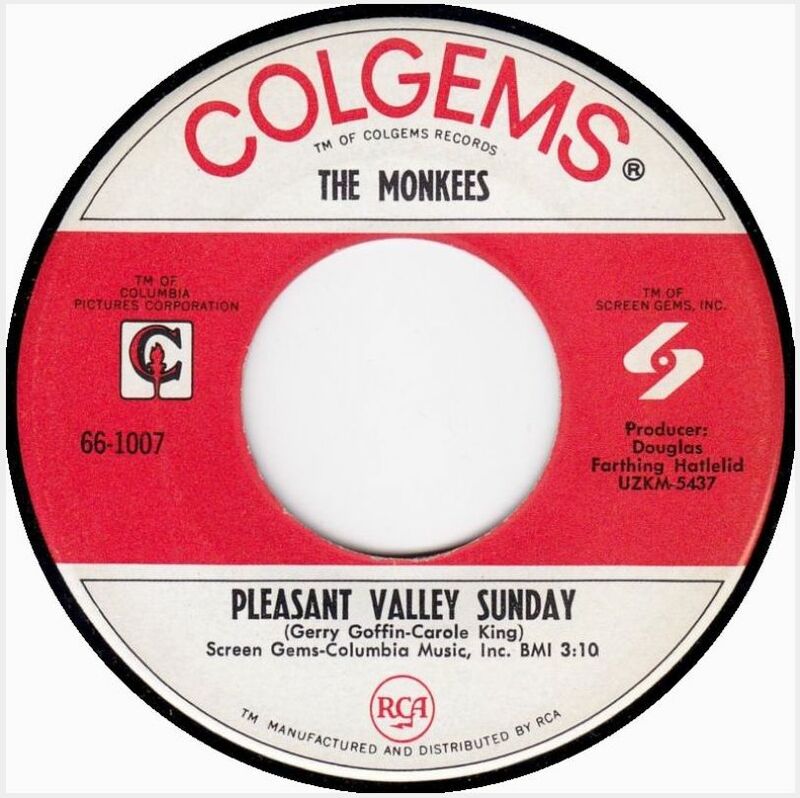 All of the band members played on the “Pleasant Valley Sunday” single except for Mickey Dolenz who is one of the two lead vocalists on the track along with Mike Nesmith. The album was produced by Chip Douglas who plays the drums here. The Mono and Stereo version of the song have entirely different vocal tracks, and the Mono version was the one used on the single. The album’s title comes from the astrological signs of each band member: Mickey Dolenz is a Pisces, Peter Tork is an Aquarius and Mike Nesmith and Davy Jones were both Capricorns. Since Nesmith and Jones shared the same birthday (December 30th), they added Jones’ name to the title to delineate the two Capricorns. It is by far their most consistent platter including some of the group’s best material including “Cuddly Toy,” “Star Collector,” “Salesman,” “She Hangs Out,” “The Door Into Summer” and the two songs that make up today’s jukebox classic. It sold three million copies and topped the album charts in 1967. 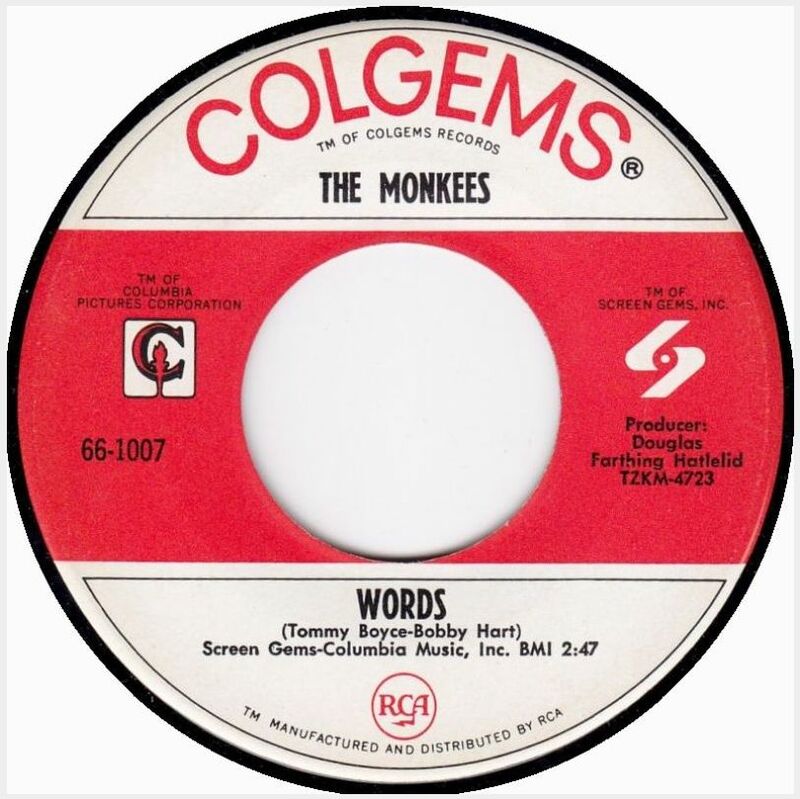 The flip of the single is the Tommy Boyce/Bobby Hart song “Words,” one of the group’s most psychedelic singles. Dolenz and Peter Tork are heard doubling up on the lead vocals, and the song climbed its way to the number eleven position of the charts which was no small feat considering that it was the flip of the single. It was the second time the group took a crack at recording the song, the first was for their second album More Of The Monkees. As with “Pleasant Valley Sunday,” the single version of “Words” is different than the album version. The song was featured in five different episodes of their TV show. Posted: January 6th, 2014 under Music, Rock, The Monkees.